Pros: At 6’2, 230 pounds, Wilson looks the part of an NFL linebacker. The guy is well put together and his play matches his physique. His ability to play off the ball and drop in coverage is proven by his four interceptions last year. He has no problem matching up with running backs or tight ends. The lateral quickness he possesses is other worldly. Wilson makes plays in space and doesn’t miss open field tackles. He is also effective on blitzes and I expect him to test well at the combine. In a starting role he will see a huge jump in production. 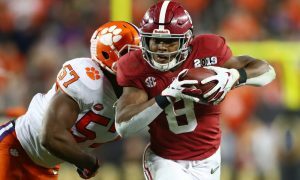 His sideline-to-sideline style of play is reminiscent of former Alabama star linebacker, Reuben Foster of the San Francisco 49ers. Cons: In 2017, Wilson missed two games after undergoing surgery for a foot injury. I want to see Wilson take on blocks with more aggressiveness. At times, he has issues disengaging from blockers. Taking better angles should improve that and those things will show up less as he gains more experience in a starting role. He needs to use better leverage instead of his natural athleticism to beat blockers because in the NFL it won’t come that easy. Overall: Wilson will be the best linebacker in the 2019 NFL Draft. He sets the standard for those around him and would be an excellent building block for any defense. The passion he plays with is obvious, the kid absolutely loves football and wants to be great. Linebackers who match up well with NFL tight ends are a hot commodity and Wilson fits that bill. His potential is immense because of all of his rare physical traits. Add in his high football IQ and you have a top 15 NFL draft pick.